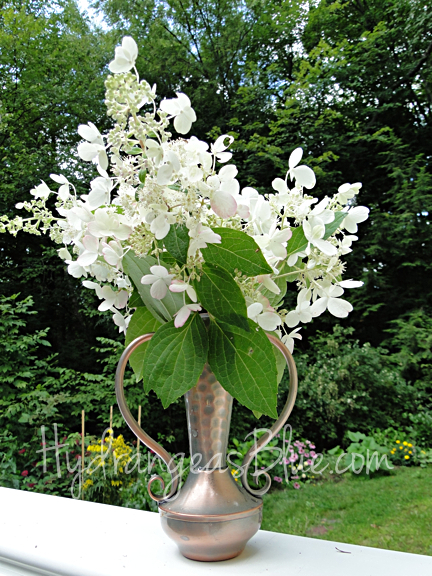 Hydrangeas with cone-shaped flowers are of the paniculata variety. In my yard I grow the ‘Limelight’ and ‘Pinky Winky’ which are both paniculata grandiflora. 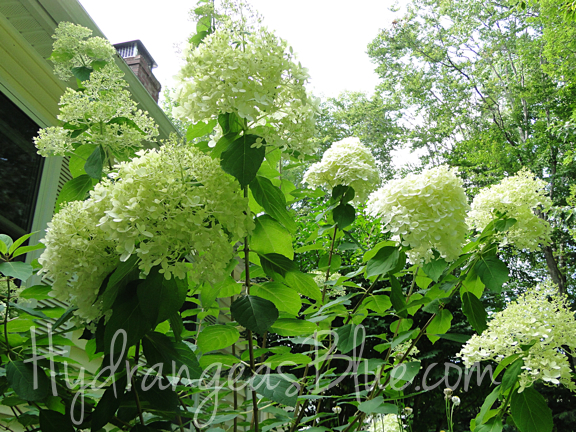 This type of hydrangea can be grown as a bush or shaped into a tree over time. Last year the blooms on the Limelight hydrangea were huge, and as the Fall season approached, the blooms began to turn light pink. They were just gorgeous. Because this type of hydrangea flowers on long stems, many people trim them into trees, with one or a few main branches that grow tall with hanging branches. Do a Google search for the paniculate grandiflora and you’ll see many lovely images. 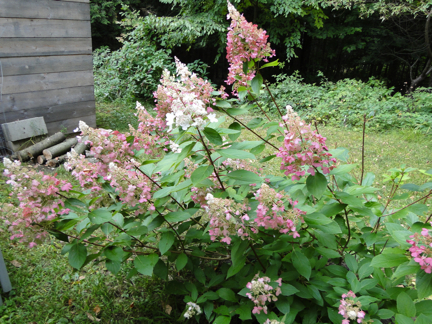 The picture below shows the same flowers shown in the picture above, just later in the season. Possibly my favorite, the Pinky Winky is also a paniculata variety which produces white flowers that gradually turn dark pink. Here is one of my photos of a little Pinky Winky bouquet made up of cut flowers before they turned pink. Please click this link to see the progression of the bloom growth and color change in the photos on a previous post. There are many other types of paniculatas, and the Pee Gee is very lovely with white flowers. I bought one, but it was crushed and never had the chance to grow. 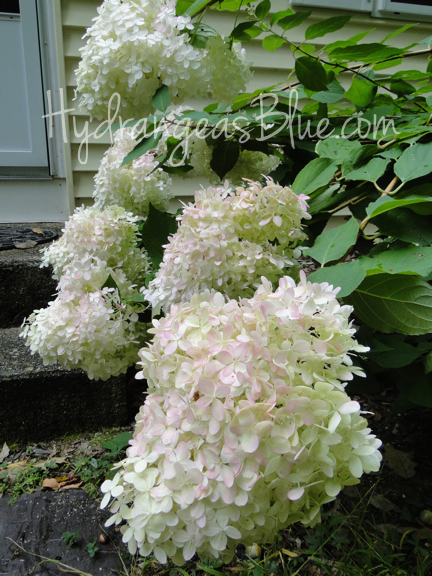 I can’t give you a personal account of it, but the Pee Gee is loved by many hydrangea fans. And there are many more. Search for what will grow well in the climate where you live, and be sure to plant the paniculata hydrangea in a space that can accommodate it’s growth.